One day we came across Campbell expressing that he saw Daddy and talking about how he had seen Daddy’s picture. At that very moment it was hard to tell what Campbell was actually talking about. In that first encounter I don’t even remember if we really learned what it was all about. Then, it happens again. Campbell was saying that he saw Daddy’s picture and this time he had gotten Mara convinced of the same. What was he talking about? It happened to be at dinner time and there were a few things that we had scattered on the table to go along with our meal. 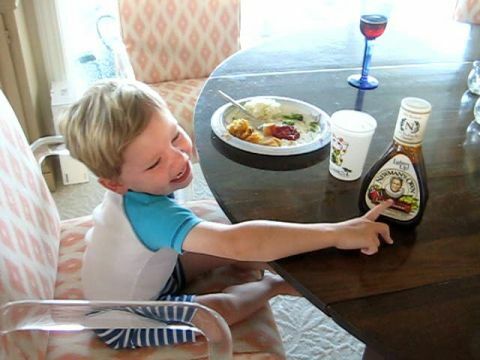 That is when we figured it out because he showed us the salad dressing bottle. Since that time, it is random when Campbell starts talking about it. Sometimes, if you aren’t paying attention, and then come upon him, you will find him talking to the picture as if he was talking to me. At the beginning of August we took a beach trip, and we took a little video of him telling everyone who his Daddy is. I guess there are worse people to get confused with. Luke, I don’t think Campbell could have mistaken you for a nicer man. His dressing and pasta business profits are only for charity. I enjoyed him in Cool Hand Luke especially.